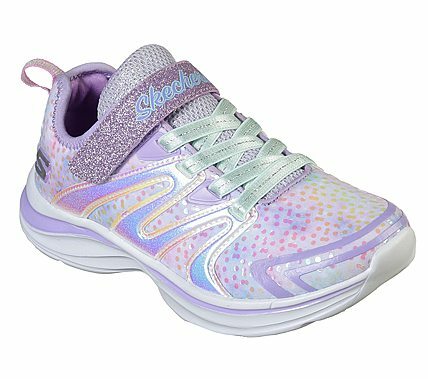 Add some sparkling magic to her sporty style with the SKECHERS Double Dreams - Unicorn Wishes shoe. Mesh fabric and metallic synthetic upper in a slip on stretch laced athletic sporty training sneaker with stitching and overlay accents. Air Cooled Memory Foam insole. Unicorn Collection sparkling iridescent decorations.